Safe Routes to School refers to a variety of multi-disciplinary programs aimed at increasing the number of students walking and bicycling to school. Education programs are an essential component of a Safe Routes to School program. Education programs generally include outreach to students, parents and guardians, and motorists. 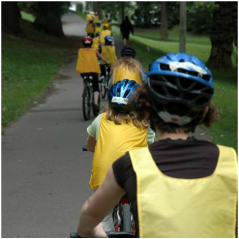 Students are taught bicycle, pedestrian and traffic safety skills. Parents and motorists receive information on transportation options and driving safely near schools. Housed in the Ulster County Health and Safety Institute of SUNY Ulster, Ulster County's Traffic Safety and Injury Prevention Program is sponsored through the Ulster County Traffic Safety Board and the Governor's Traffic Safety Committee. Educational and informational programs, together with a resource library, are available to community organizations at no cost. As part of this program, various driver, cyclist and pedestrian education resources and safety clinics are offered in various locations around the County, often at no cost (call for more information). The Institute is headquartered on SUNY Ulster's Stone Ridge, NY campus. For further information, schedule of upcoming events, or to discuss the development of a program in your area call 800: 724-0833, extension 5014 or 845: 687-5014, or e-mail the Institute Director, Pamela Wanning, at wanningp@sunyulster.edu. Student education programs are an essential component of a Safe Routes to School effort. 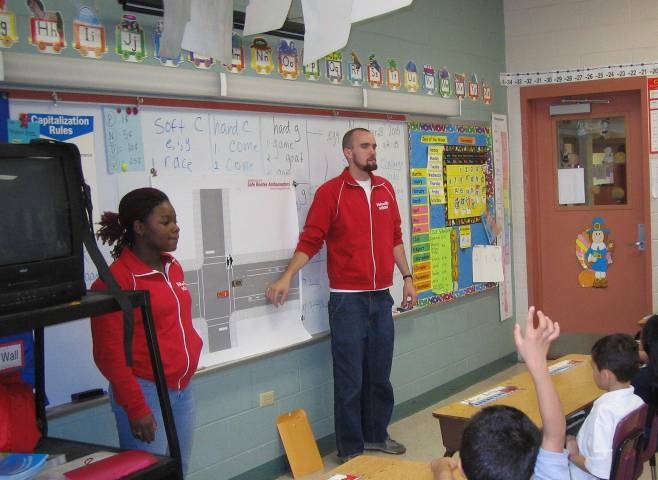 Students are taught traffic safety skills that help them understand basic traffic laws and safety rules. Example elements include traffic sign identification and instruction on how to use a crosswalk. An existing pedestrian traffic safety education lesson is currently in use at Ostrander Elementary School in Ulster County. Typical bicycle education curriculum elements can be presented in two parts: knowledge and skills. The knowledge lessons are typically in-class while the skills curriculum is practiced on bike. Typical lessons include helmet and bike fit, hand signals, and riding safely with traffic. Parents make the final decision about their children's transportation habits and must be confident in their children's ability to walk to and from school safety. Educational materials oriented toward parents can address concerns by providing tips for safe walking, and can also provide suggestions for safe and courteous biking and driving around pedestrians. Parents should be reminded that their children emulate their behaviors and it is a parent's responsibility to model good behavior regardless of the travel mode they choose. A variety of existing lessons and classroom activities are available to help teach students about walking, bicycling, health and traffic safety. These can include lessons given by law enforcement officers or other trained professionals or as a lesson plan developed by teachers. Example topic lessons are: Safe Street Crossing; Helmet Safety; Rules of the Road for Bicycles; and Health and Environmental Benefits of Walking and Biking. The lessons should be grade-appropriate and can be incorporated into the subjects of health, environment, social science, math and physics. Sample lesson plans are available at a number of Safe Routes to School program websites. Bicycle Rodeos are family-friendly events that incorporate a bicycle safety check, helmet fitting, instruction about the rules of the road and an obstacle course. Adult volunteers can administer rodeos, or they may be offered through the local Police or Fire Department. Bicycles rodeos can be incorporated into health fairs, back to school events and Walk and Bike to School days. Rodeos also provide an opportunity to check children’s bikes and instruct them on proper helmet use. A School Zone Traffic Safety Campaign creates awareness of students walking and bicycling to school. A safety campaign is an effective way to reach the general public and encourage drivers to slow down and look for students walking and biking to school. A School Zone Traffic Safety Campaign uses signs and banners located near schools (for example, in windows of businesses, yards of people’s homes and print publications) to remind drivers to slow down and use caution in school zones. This campaign can be kicked off at the start of each school year or in conjunction with special events, such as Walk and Bike to School Month, which takes place in October. This can also be accomplished with or in conjunction with a “share the road” campaign. Many schools use buses to transport students who are too far away to walk to school. School buses are large and restrict sight lines for drivers, pedestrians and bicyclists. It is difficult for drivers and students to see each other around school buses. Schools can implement a bus safety campaign that reminds students to walk and ride cautiously around buses and to wave and communicate to the bus driver. A coordinated, well-designed signage system improves the coherency of the bikeway and path system and can provide a greater sense of user security and comfort, as users receive confirmation that they are on the correct route and are aware of how far they have to travel to reach their destination. Wayfinding signage should be coordinated with development of walking and bicycling maps. The development of a county map of trails and on-road bike routes is recommended, which can work in conjunction with a “suggested routes to school” map, as described under Section 4.4.